One of the club's greatest-ever goalscorers; only Roger Hunt has scored more in League games for Liverpool but all of Gordon's 232 League strikes came in the First Division - from 359 games, a fantastic goals-per-game ratio. Gordon came to England as one of the youngest members of a South African touring side but chose to stay in the country, thankfully as far as Liverpool Football Club was concerned! He played in 12 matches towards the end of the 1925-26 season, scoring 4 times, but that was just a taste of what was to come. Over the next nine seasons, he missed very few games in League and cup and scored prolifically throughout that period. It was a shame that this golden run coincided with a barren period for the club because his contribution to the Liverpool cause was massive and he deserved to end up with more than the handful of England and Football League representative honours he received. He was such a consistent performer that it is perhaps difficult to single out years that were extra-special for him, but perhaps the two seasons when he scored 30 or more First Division goals (1928-29 & 1930-31) showed him at his peak. The 36 League goals he scored in the second of those two seasons set a club record that would not be beaten (by Roger Hunt) for over thirty years. There were three hat-tricks that season in home games but perhaps it was the four goals he scored in an away match at Hillsborough that gave him the most satisfaction ? 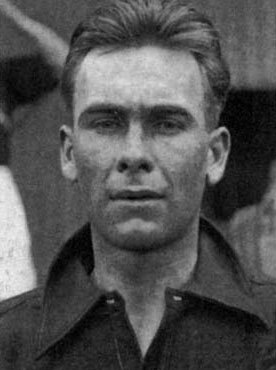 Gordon moved to Aston Villa in January 1936 at the age of 31 and then left the Midlands for Yorkshire when he joined Leeds United a year later. He was still as prolific as ever, scoring FIVE times when Leeds beat Leicester City in October 1938, and became one of the very few men to have scored over 300 times in Football League matches. He was an all-round sportsman, having played cricket on over 50 occasions for Lancashire. But soccer was his first love and it was no surprise that he progressed from player to manager, which he did by taking charge of team affairs at Port Vale in October 1946. He was there for over four years and saw them move to their current stadium (Vale Park) in 1950. With a promising managerial career still in its infancy, it came as a great shock when he died in Stoke-on-Trent on 14th June 1951 at the early age of 47. 1930 v Northern Ireland, Wales; 1931 v Scotland (3). John Keith on Gordon Hodgson: "He was a really top class striker and also a tremendous cricketer in the summer. Clearly in the 1920's I would say he was one of the best strikers in the business and again his name will always be up there with the best scorers of all-time in Liverpool's history, up alongside the likes of Hunt, Rush, Fowler and Owen."